By combining the power of Hubble Space Telescope, Spitzer Space Telescope, and one of nature's own natural "zoom lenses" in space, astronomers have set a new distance record for finding the farthest galaxy yet seen in the universe. The diminutive blob, which is only a tiny fraction of the size of our Milky Way galaxy, offers a peek back into a time when the universe was 3 percent of its present age of 13.7 billion years. The newly discovered galaxy, named MACS0647-JD, is observed 420 million years after the big bang. Its light has traveled 13.3 billion years to reach Earth. This is the latest discovery from a large program that uses natural zoom lenses to reveal distant galaxies in the early universe. 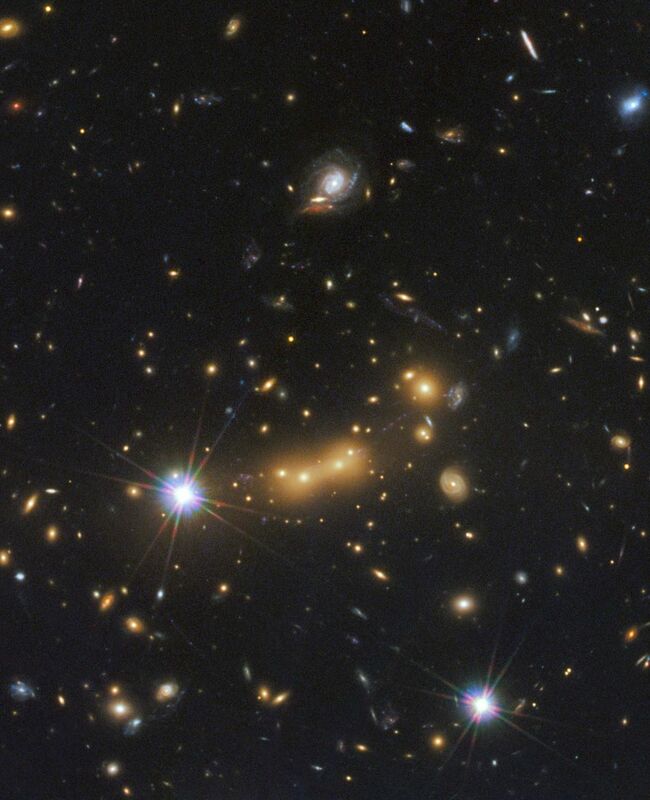 The Cluster Lensing And Supernova survey with Hubble (CLASH) is using massive galaxy clusters as cosmic telescopes to magnify distant galaxies behind them, an effect called gravitational lensing. Along the way, 8 billion years into its journey, this light took a detour along multiple paths around the massive galaxy cluster MACS J0647+7015. Due to the gravitational lensing, the CLASH research team, an international group led by Marc Postman of the Space Telescope Science Institute in Baltimore, Md., observed three magnified images of MACS0647-JD with the Hubble telescope. The cluster's gravity boosted the light from the faraway galaxy, making the images appear approximately eight, seven, and two times brighter than they otherwise would, enabling astronomers to detect them more efficiently and with greater confidence. Without the cluster's magnification powers, astronomers would not have seen this remote galaxy. "This cluster does what no manmade telescope can do," said Postman. "Without the magnification, it would require a Herculean effort to observe this galaxy." The object is so small it may be in the first embryonic steps of forming an entire galaxy. An analysis shows that the galaxy is less than 600 light-years wide. Based on observations of somewhat closer galaxies, astronomers estimate that a typical galaxy of that epoch should be about 2,000 light-years wide. For comparison, the Large Magellanic Cloud, a companion dwarf galaxy to the Milky Way, is 14,000 light-years wide. Our Milky Way is 150,000 light-years across. "This object may be one of many building blocks of a galaxy," explained Dan Coe of the Space Telescope Science Institute, lead author of the study. "Over the next 13 billion years, it may have dozens, hundreds, or even thousands of merging events with other galaxies and galaxy fragments." The estimated total mass of the stars in this baby galaxy is roughly equal to 100 million or a billion suns, or about 0.1 percent to 1 percent the mass of our Milky Way's stars. The galaxy was observed with 17 filters — spanning near-ultraviolet to near-infrared wavelengths — using Hubble's Wide Field Camera 3 (WFC3) and Advanced Camera for Surveys (ACS). Coe, a CLASH team member, discovered the galaxy in February 2012 while pouring through a catalogue of thousands of "lensed" objects found in Hubble observations of 17 clusters in the CLASH survey. MACS0647-JD, unlike all the others, only appeared in the two reddest filters. "This immediately told us that MACS0647-JD is either a very red object, only shining at red wavelengths, or it is extremely distant and its light has been 'redshifted' to these wavelengths, or some combination of the two," said Coe. "We considered this full range of possibilities." Coe and his collaborators spent months systematically ruling out these other alternative explanations for the object's identity, including red stars, brown dwarfs, and red (old and/or dusty) galaxies at intermediate distances from Earth, and concluded that a very distant galaxy was the right explanation. "All three of the lensed galaxy images match fairly well and are in positions you would expect for a galaxy at that remote distance when you look at the predictions from our best lens models for this cluster," Coe said. The paper will appear in the December 20 issue of The Astrophysical Journal. Redshift is a consequence of the expansion of space over cosmic time. Coe estimates that MACS0647-JD has a redshift of 11, the highest yet observed. The wavelengths of near-ultraviolet light from the galaxy have been stretched into the near-infrared part of the spectrum as the light traveled through an expanding universe. "At early times, galaxies are ablaze with hot, young blue stars, but they appear extremely red when we see their light with Hubble." Images of the galaxy at longer wavelengths obtained with the Spitzer Space Telescope played a key role in the analysis. 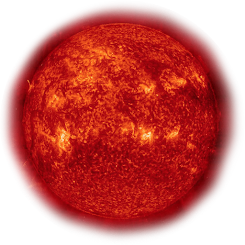 If the object were intrinsically red, it would appear bright in the Spitzer images. Instead, the galaxy was barely detected, if at all, indicating its great distance. The research team plans to use Spitzer to obtain deeper observations of the galaxy, which should yield confident detections as well as estimates of the object's age and dust content. The first galaxies probably formed somewhere between 100 million and 500 million years after the big bang, the astronomers said. Galaxies formed at earlier times are found to be more pristine, relatively free from heavy-element enrichment by later generations of supernovae. The small-fry galaxy, however, may be too far away for any current telescope to confirm the distance based on spectroscopy, which spreads out an object's light into thousands of colors. Nevertheless, Coe is confident the fledgling galaxy is the new distance champion based on its unique colors and the research team's extensive analysis. By measuring how bright the object is at various wavelengths, the team determined a reasonably accurate estimate of the object's distance. Near-infrared wavelengths are the most critical to making distance estimates for such far-off objects. The galaxy will almost certainly be a prime target for the James Webb Space Telescope. "We are reaching the limit of Hubble's vision because the galaxy is barely resolved," Postman said. "To really see finer structure you need a bigger telescope." At near-infrared wavelengths, Webb's resolution will be three times sharper than Hubble's. The Webb telescope's larger mirror will also collect enough light to obtain a spectrum of MACS0647-JD. This will yield a more definitive and precise measurement of the galaxy's distance, as well as the galaxy's mass, age, and amount of heavy elements it contains, which were forged by the first generation of stars.